Step into the fun house where music, cinema and the occult finally mix. The music itself is wonderfully perverse: a languid but steadily building Middle Eastern-sounding drone, festooned with evil chanting, tabla, screaming mellotron, a sonically shifting low frequency foreboding ambience and shimmering 12-string guitar work. It’s a mad, diabolical symphony of beautiful evil; a fascinating piece of unconventional aggressively avant-garde music from one of the rock era’s most mysterious living legends. Guitar World: There was always a certain amount of speculation about your occult studies. It may have been subtle, but you weren’t really hiding it. Page: I was living it. That’s all there is to it. It was my life – that fusion of magick and music. Guitar World: Your use of symbols was very advanced. 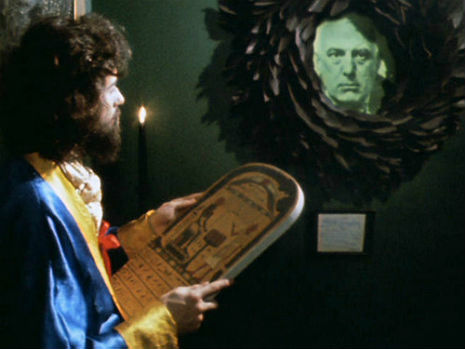 The sigil on Led Zeppelin IV and the embroidery on your stage clothes from that time period are good examples on how you left your mark on popular culture. It’s something that major corporations are aggressively pursuing these days: using symbols as a form of branding. Page: You mean talismanic magick? Yes, I knew what I was doing. There’s no point in saying much about it, because the more you discuss it, the more eccentric you appear to be. But the fact is – as far as I was concerned – it was working, so I used it. But it’s really no different than people who wear ribbons around their wrists: it’s a talismanic approach to something. 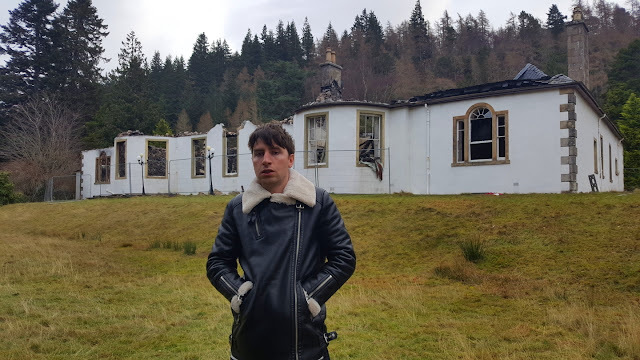 Being able to picture Jimmy in the dark at Aleister Crowley's haunted Boleskine House creating this music has always fascinated in that it feels so dark and hypnotic like a cobra. Where was this different music coming from, in 1972-73 with the speed of Zeppelin's ascent the adrenaline of success mixed with Jimmy's 'Do what though wilt'' evocation on the groove-out to Led Zeppelin III seems to have done the trick. But this music was different to what Page was recording with Led Zeppelin. 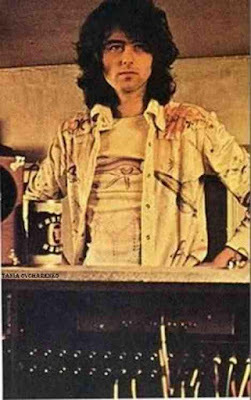 Page's soundtrack was finally released in 2012 after decades of it being a sought after prize and one of Led Zeppelin's biggest bootleg's to own. It's the type of album you put on before an Eyes Wide Shut naked virgin scene as she lies down on the alter and the ceremony begins. At 31 minutes the soundtrack is a short and sweet spell, entrancing the listener mere seconds into it's first peculiar Moroccan drone, similar to some of Brian Jones's experiments in 1967 on The Rolling Stones 'Satanic Majesties Request' album inspired by the Master Musicians of Joujouka in Morocco and their pipes of pan goat sacrifice. 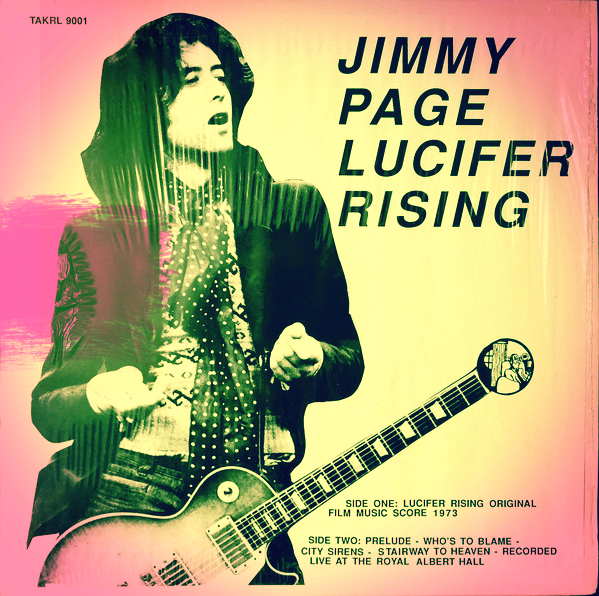 Eventually Page’s music escaped in 1981—probably sourced from the magnetic track from an early 23-minute-long “to be continued” print of Lucifer Rising that Anger showed potential investors (I’ve seen this, it’s pretty incredible)—when it hit the bootleg market as “Solo Performances by Jimmy Page and Robert Plant,” a limited edition LP with a green wax seal. Another blue vinyl version was released in a Kabbalistically numbered limited edition. 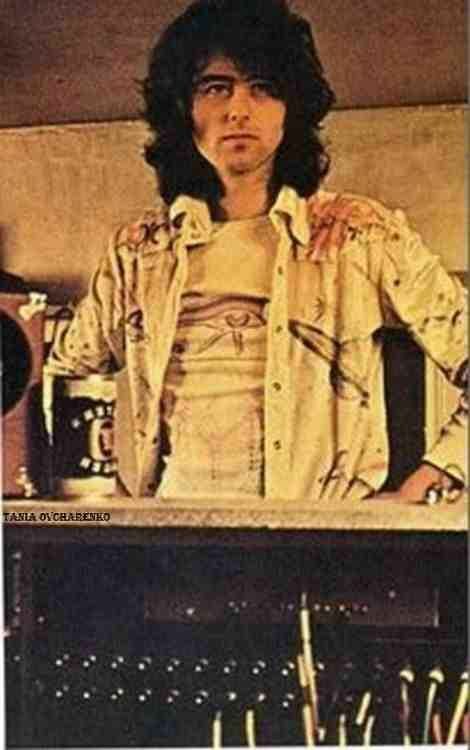 Better quality digital versions started making the rounds on torrent trackers around 2005 and last year Jimmy Page released the music he’d composed for Anger’s film via his website on very limited edition red vinyl that sold out instantly.